Here is a look at some of the Policy Studies Program's current and recent projects. Easton, Pa. — Imagine being able to change the future by altering DNA right now. With the discovery of a new genetic technology called CRISPR-cas9, it’s possible. But, how should this ground-breaking tool be used, and what are the potential consequences? This topic will be explored in depth by Lafayette College students in a brand new program called Open for Debate, which will broadcast on PBS39 on Tuesday, May 2 at 7:30 p.m.
About 50 students from multiple majors were involved in the production, which was led by Professors Mark and Nicole Crain’s courses in policy studies and economics. Students explored topics like CRISPR’s ability to cure genetic diseases, how the technology can aid in the production of biofuel, and how to regulate CRISPR and use it ethically. The broadcast features an exclusive interview with Dr. Jennifer Doudna of the University of California Berkeley. As the co-discoverer and champion of CRISPR-cas9, Dr. Doudna has been named one of TIME’s 100 Most Influential People. Hannah Doherty ’19, a policy studies major from New Jersey and Danielle Wolff ’17, a neuroscience major from New Jersey, conducted the interview at The Franklin Institute in Philadelphia. Wolff said the opportunity to speak with Doudna, hailed by many as a potential Nobel Prize winner, was a remarkable experience. “Dr. Jennifer Doudna is not only an amazing scientist and innovator, but also a kind and compassionate woman. She took the time to explain how CRISPR technology works and enthusiastically answered a multitude of questions from Lafayette students,” Wolff said. 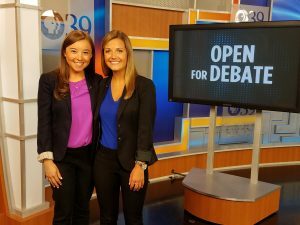 Open for Debate provides a distinctive learning opportunity for Lafayette students to address complex topics at the intersection of business, policy, and technology. “We demand high-level scholarship and communicate findings through the visual media. Working with PBS39 Executive Producer Laura McHugh offers a rare opportunity for students to meet this challenge,” said Mark Crain. The 30-minute program is anchored by Doherty and Natalie Gosnell ’18, a policy studies and Spanish double-major from Maryland. 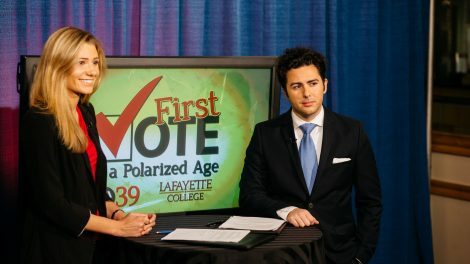 The student-run two-hour live broadcast covered all of the US national elections and aired on PBS39. More than 120 students from multiple majors delivered the results and provided up to the minute analysis and commentary. The broadcast also featured video essays, short segments about politics and policy from the perspectives of voters. 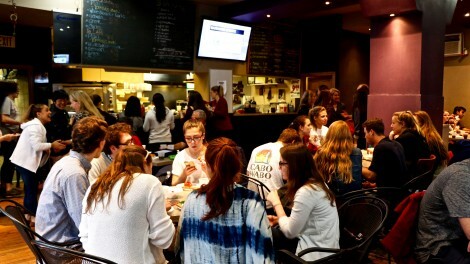 The spring 2016 edition of Lafayette Lens on PBS39 was a collaboration between two Policy Studies courses, the Health and Life Sciences seminar, independent study students, and students participating as a co-curricular activity. In total, about 60 students and five professors were involved in the production.